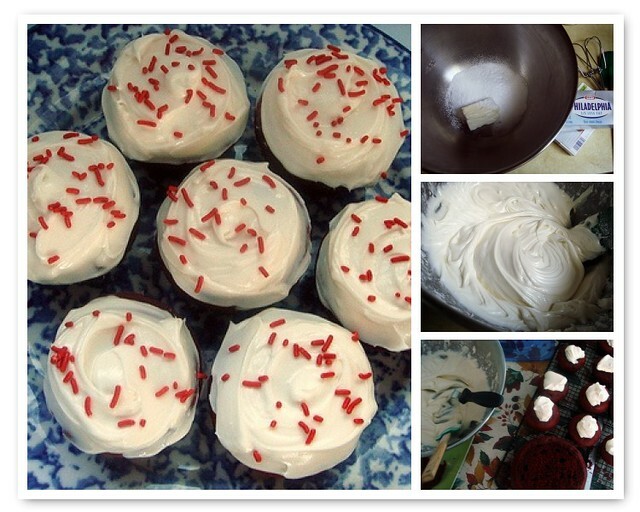 Please vote for my cupcakes! As I mentioned a week ago, I am reviewing three items I got from Wayfair as part of their Preferred Blogger program. The purchases were compensated with a gift code, but this doesn't deter the objectivity in my reviews. I appreciated how timely their offer was, since my old tea kettle had broken and I was looking for a replacement. 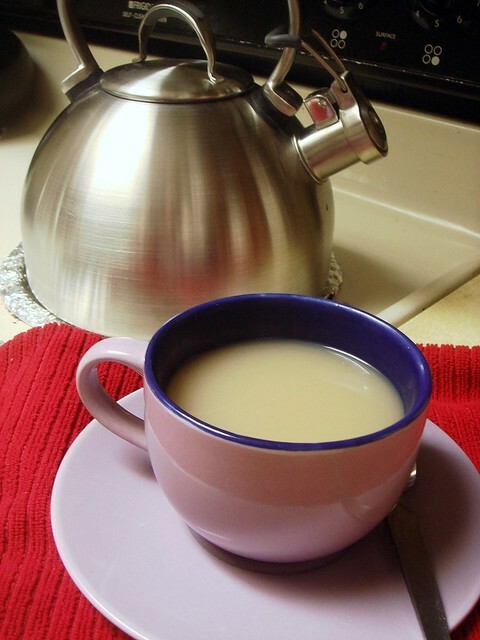 I had debated between an electric kettle over the traditional stove top kettle with a whistle. The pros for the electric kettle was rapid heating (in under 5 minutes for a full pot) and auto shut off, though I'm lazy and if I walk away I might forget I had heated up water in the first place. I also lack the counter space so I went with this lovely and sleek KitchenAid Gourmet Essentials 2 Quart Tea Kettle in Brushed Stainless Steel. The price is $49.98, and shipping is free on this item when purchased through Wayfair. Besides the pretty brushed 18/10 stainless steel body, which adds style to the kitchen, the handle features silicone grips on the top and bottom. I'm not sure why they didn't decide to wrap the handle entirely with the silicone, though the handle remained cool so in the end it doesn't matter. Unlike my former tea kettle, the whistle cap isn't opened with a sliding mechanism attached to the handle. You have to flip the tab open, which rests under the handle, but it doesn't feel awkward so I didn't have an issue there. Obviously you need to put the cap back down for next time. The pot is fairly lightweight when empty, so it's not too heavy when filled with water. For first time use, the instructions tell you to wash with warm, soapy water, drying the outside when finished. There's a line on the outside underneath the spout that says "maximum", though on the inside there is no line indicator. It would have been a nice feature to have, like my coffee percolator, though all you need to remember is to keep the water level under the spout, otherwise it will interfere with the whistling process. I filled the pot about 1/2 an inch under the spout and place on the stove. The handle is somewhat obtrusive when it comes to filling the pot with water, but not enough to make it a hassle. Simple to follow, though I'll have to keep in mind about not cranking the heat all the way to the highest setting, as I've done with my old kettle. On medium high, the mostly filled pot took about 12-13 minutes to boil cold water on an electric burner, though times will differ based on your stove. 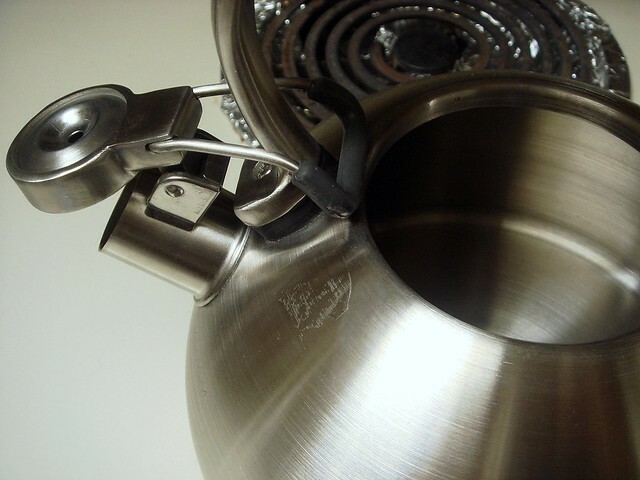 This kettle also works for a wide variety of stove top surfaces, not just electric ranges. 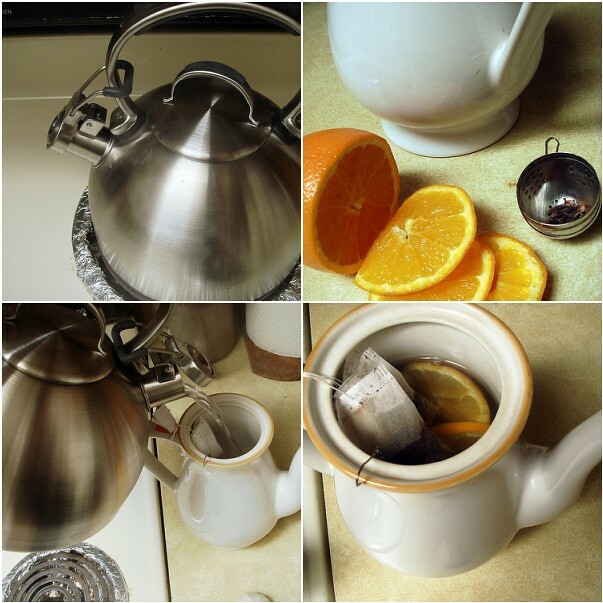 As the water heated up, I prepared the large teapot with black tea bags, orange slices, and a few whole cloves in a tea ball for spiced tea. The whistle on this kettle is pretty loud, so unless your iPod is cranked up to the max you won't have to worry about missing it. It's almost like one of those firecrackers with the reports, or at least that's what I initially thought of. 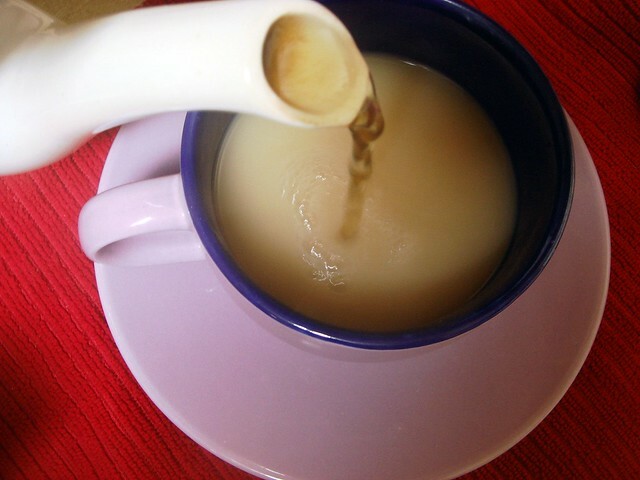 The water doesn't dribble when poured, and although I didn't completely fill the kettle up I had enough water for a full pot of tea. 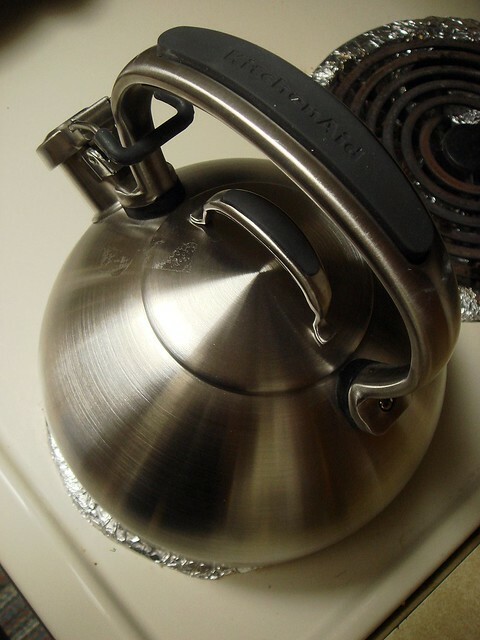 I'm not sure how long the water remains hot in the kettle if you don't use it all, but I'm going to estimate that it stays hot for at least 10 minutes after removing the kettle from the heat. This is a bit more than what I'd have payed alone for a kettle. However, since it doubles as a decorative kitchen piece it was worth the extra cost, and KitchenAid is a good brand. 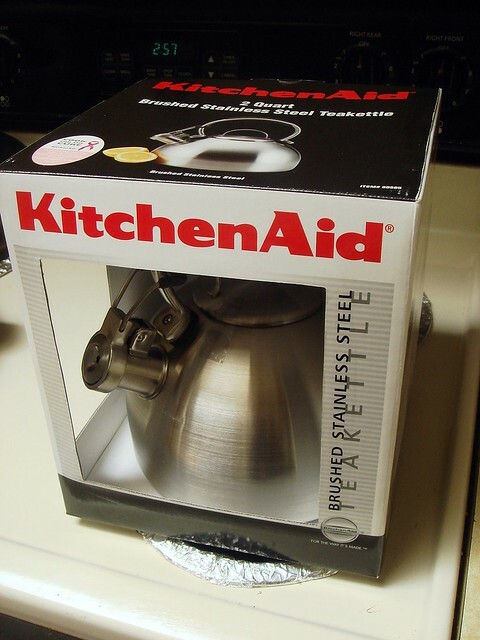 It's pretty, heats up to 8 cups of water, and is covered by a 1 year warranty which protects against general wear and use in the kitchen (basically, you won't be covered if you drop the kettle and it dents, but if the handle falls off or something like that occurs just by general use, KitchenAid will probably help you out). So far, I'm happy with this item and I like that I will continue to hear the whistle of the kettle when I make tea in the morning. 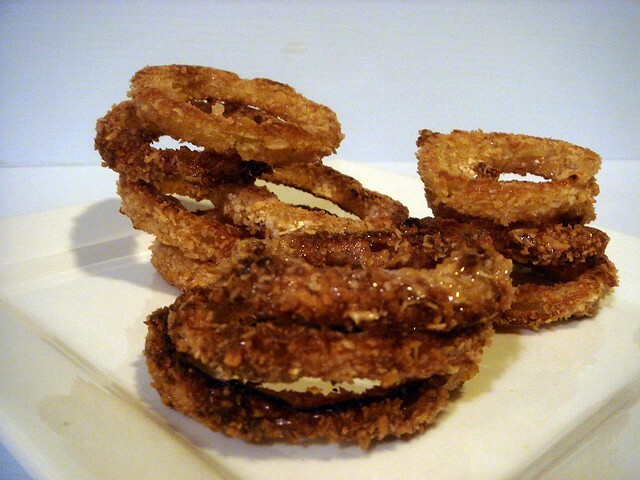 I was perusing blogs and came across a recipe for baked onion rings. What drew me to try them was that they really did look like the real deal, minus the hassle of frying. 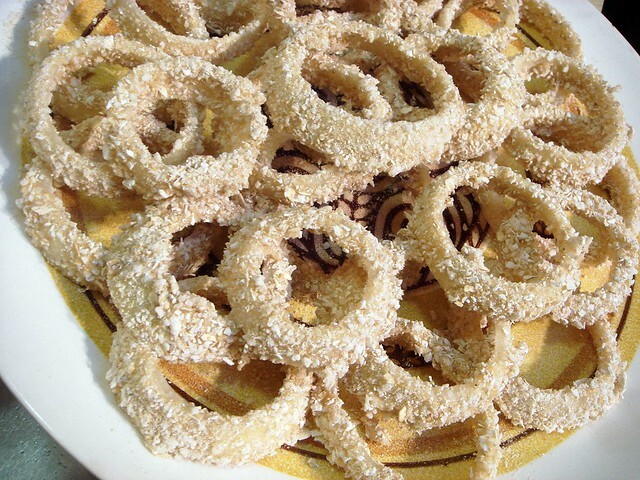 The coating evenly coated the onion rings and the mixture remained intact. 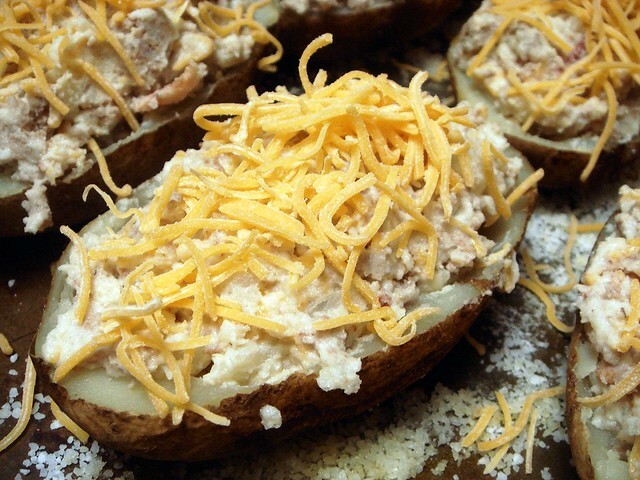 After baking, the crunchy coating was evenly crisp with a perfectly cooked onion in the center. I was sold, and knew that the effort would pay off with crunchy deliciousness. To start, you prepare a thick buttermilk mixture with flour and seasonings. You'll want to make sure this is properly seasoned since all the flavorings are mixed into the buttermilk mixture instead of the coating (which you can also jazz up with an herb blend, if desired). For the coating, the directions call for cornflakes and bread crumbs, though I didn't have any. Rice Krispies make a good substitution, as well as bran flakes or any light, relatively flavorless cereal. I replaced a bit of the rice cereal with oatmeal ground to a powder. I liked the flavor it added, though the coating was a little mealy. Not enough to detract from the taste, so I might do it again. Make sure all excess buttermilk mixture has dripped off the onion rings, otherwise it'll leave to many clumps in the crumb mixture. Work with half the crumb mixture at a time, adding more when you get low. This will prevent more of the mixture from clumping. Use your other hand to coat the rings with the crumbs, preferably using a fork. 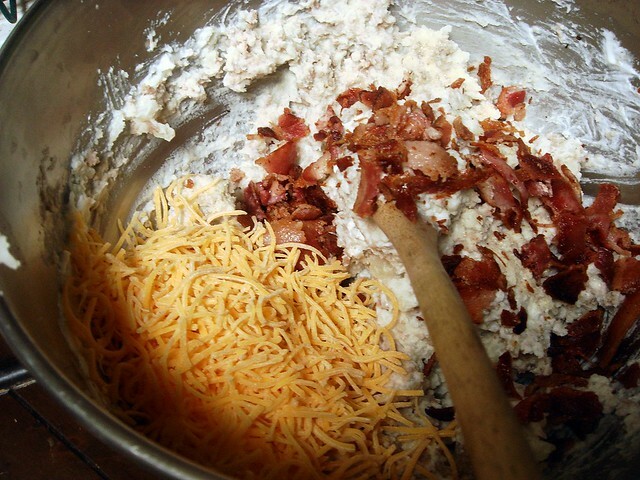 The less you dip your fingers in the mixture, the less messy it'll be. I found that the rings, once coated in both mixtures, can be left to air dry for a couple of minutes, or even up to an hour. You might then be able to freeze the rings and cook later. If you opt to try this out, freeze in a single layer on wax paper lined baking sheet. Transfer to a gallon size ziploc bag to freeze for up to a week. To bake, a few tablespoons of oil are heated on a rimmed baking sheet in the oven before the rings are placed on the sheet. This most likely assures maximum crispiness and mimics the frying technique. It produces a very crisp ring with a light and crunchy coating. The flavor was great, and these make a nice addition to hot dog, sandwiches, and burgers as well as soups, or simply for general snacking. Serve alongside your favorite dipping sauce and you're good to go. Preheat oven to 450 degrees. In a food processor, pulse cornflakes and breadcrumbs until fine crumbs form, then transfer half to a medium bowl. In another medium bowl, whisk together egg, buttermilk, flour, and cayenne and season with salt and pepper. Dip onion rings in egg mixture (letting excess drip off) and dredge in cornflake mixture (adding more when needed); place on a large plate. Rings can stand for up to an hour. Pour oil onto a rimmed baking sheet. Place in oven and heat 2 minutes. Remove sheet from oven and tilt to coat evenly with oil. Arrange onion rings on sheet. 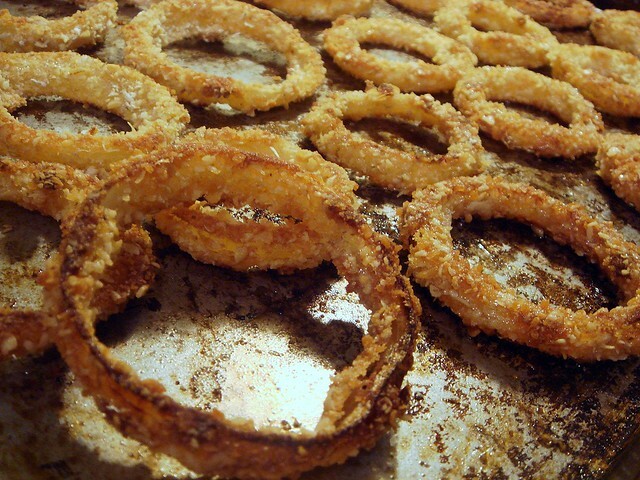 Bake, turning once, until onion rings are golden brown, about 16 minutes. POM Wonderful made a few changes to the voting process due to errors with the Facebook "like" button. The votes have been reset to zero for everyone, and you can now vote once per day. If you've already voted, I apologize for the inconvenience and thank you for your support! All you have to do now is click the icon below to vote again, and remember to vote everyday up until the 28th. Oh Nuts! Sweepstakes, blog giveaway, and other such randomness. You guys may have seen previous posts regarding Oh Nuts giveaways and product reviews. You may remember that they let me host a giveaway for Oh Nuts' collaboration with the film Life As We Know It. They gave me 4 passes to see the early release in Chicago, which was pretty cool. They also are wrapping up their sweepstakes, so click on the banner and enter to win a Hi-Def TV and Blu-Ray Player, along with a copy of Life As We Know It on Blu-Ray. If that doesn't work out for you, they are also giving away 10 copies of the film on either standard dvd or blu-ray. Sign up! On another Oh Nuts related note, if you'd like to learn more about how the company began, the owner and the employees, and how they strive to make Oh Nuts good for their customers, check out their interview on Building Success. The topic is "strengthening relationships" and how they build customer loyalty. If you're in Brooklyn, take some time to visit their store! 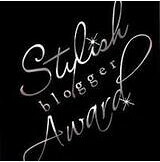 My friend Micki from Running, and What Not presented me with the Stylish Blogger Award. The requirements of receiving this award are that I have to present you with 7 facts about myself as well as passing the award along to 7 bloggers, which I think I'll forgo. Not that I can't think of a single blogger to award, but because I don't feel like it right now. I operate a personal shop on Etsy called, Catty Knits. I don't currently have anything listed because I haven't gotten around to it, which is a terrible business practice, but my Flickr set shows what all I do, particularly the copper wire and bead bracelets. I've even had business cards made up. My new running shoes finally arrived. 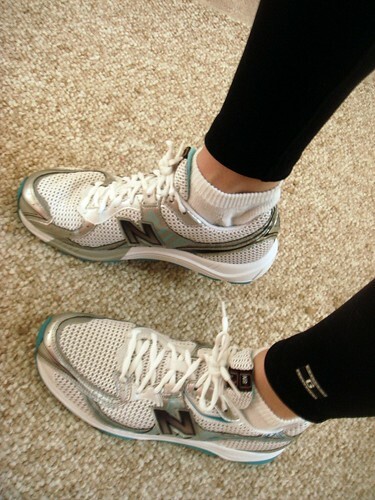 I italicize it because the story goes as follows: Shoe Fit on Running Warehouse told me, based on the size of my current shoe, I would be a size 9 in New Balance 801s, which are being discontinues and with a 15% off coupon code I bought for a nice $50. Well, I didn't believe it. I've pretty much been a size 10 in running shoes since I've started running, and although this model says it "runs large", I still didn't listen. I ordered the 10s and it was ridiculously large. Returned for the 9.5s, which were still a little floppy. I currently run in New Balance 100s, a racing flat for trails... on the road. I like them because they're light, not too cushy, offer excellent feel, and are snug. I pretty much have become accustomed to snug fitting shoes and believe the snug fit is why I haven't had a blister in months. So finally the 9s arrived and the fit is really good. There's a tiny gap around the heel, it feels like, though I can try and tighten the laces to fix it. If these don't work, there is no 8.5. Also, I got a free NB long sleeve shirt and RW book bag that I haven't used in case I was going to return it. I suppose I could keep it, but the only reason why I got it was because I purchased these shoes that were over $50, so the right thing to do is return them if these don't work out (I am hoping they do work out, damn it!). I really like ramen and Annie Chun's noodle bowls. I've come to like ramen in bowls better than packets because the noodles don't get as soggy. I haven't raced since July of last year. I'm feeling more confident with entering cooking contests, not necessarily because I know I'll win but because I have more faith in my ability to be able to create fairly interesting ideas. I thank Foodbuzz and the U.S. Dry Pea & Lentil Council for the push. It's warming up. It may not stay this warm, but I almost wish it were staying cold, snowy, and all around despicable so I have an excuse to not run as much. I'm terrible. 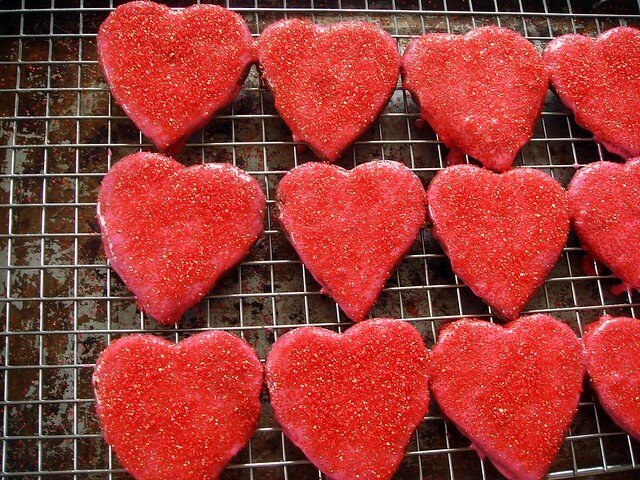 I'm on somewhat of a role for Valentine themed baking. I'm usually lucky if I get just one up the day before. 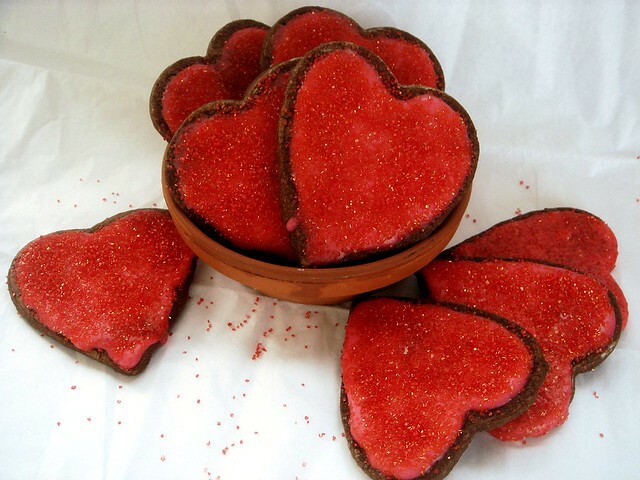 What are you guys baking for Valentine's Day? These chocolate butter cookies come from America's Test Kitchen. What makes them different is the method of preparation, mostly blooming the cocoa powder with butter and instant espresso powder. This brings out the depth of flavor from the cocoa, which the espresso powder boosts. You then proceed by mixing the remaining butter with the sugar, salt (which I increased by 1/4 teaspoon) and chilled cocoa mixture. As the recipe only has egg yolks, the cookies are a bit denser than a typical butter cookies, especially since there is no leavening. The texture is mealy, almost like a shortbread-brownie hybrid. Part of the reason I hesitate to make decorated cookies is because they're time intensive. Most of it is that I hate eating such a beautifully designed piece of work. In this case, I simply dipped the tops of the cookies in royal icing (the best kind of icing for decorating sugar cookies, in my opinion) and sprinkled with sanding sugar after 3 minutes. I waited so that the sugar wouldn't seep into the icing, but would stand out more once it had dried a little. 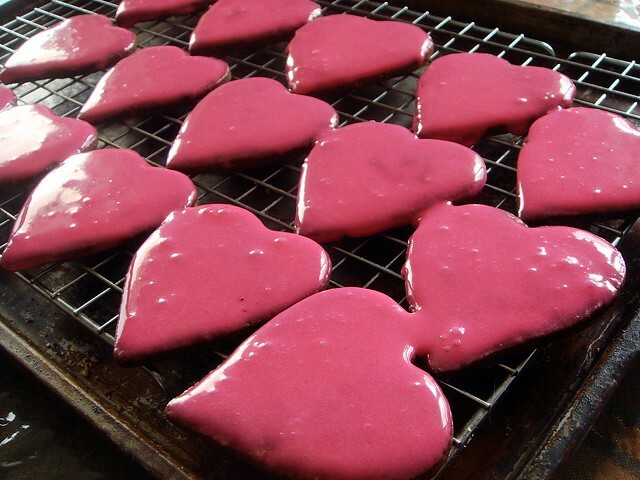 You can also use a small offset spatula to spread the icing on top, as I did with these cookies. The royal icing dries into a thin, crisp candy-like shell, and the sugar provides a nice crunch. The contrast between the topping and the cookie balances nicely, and the cocoa in the cookie keeps the icing from being overly sweet. I highly suggest trying this recipe out, even if you've had trouble with rolled cookies in the past. You'll be glad you did and you'll end up with dozens of tasty cookies! Adjust oven rack to middle position; heat oven to 375°. Melt 4 tablespoons butter in medium saucepan over medium heat. Add cocoa powder and espresso powder; stir until mixture forms smooth paste. Set aside to cool, 15 to 20 minutes. In a large bowl, mix remaining 16 tablespoons butter, sugar, salt, and cooled cocoa mixture on high speed with a electric mixer until well combined and fluffy, about 1 minute, scraping sides of mixing bowl once or twice with rubber spatula. Add yolks and vanilla and mix on medium speed until thoroughly combined, about 30 seconds. Scrape sides of bowl. With mixer running on low, add flour in three additions, waiting until each addition is incorporated before adding next and scraping bowl after each addition. Continue to mix until dough forms cohesive ball, about 5 seconds. Turn dough onto counter; divide in half and press into a square. Wrap each square in plastic wrap and refrigerate until dough is firm yet malleable, 45 to 60 minutes. Roll out 1 dough disk between 2 large sheets wax paper (sprinkled with confectioners' sugar, or parchment paper) to even thickness of 3/16 inch. Chill in freezer until firm. 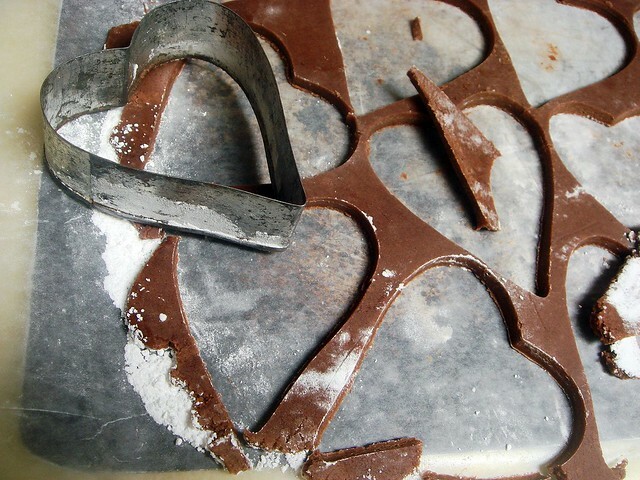 Peel wax paper from one side of dough and cut into desired shapes using cookie cutter(s); place shapes on parchment-lined baking sheet, spacing them about 1 inch apart. Gather dough scraps and chill. 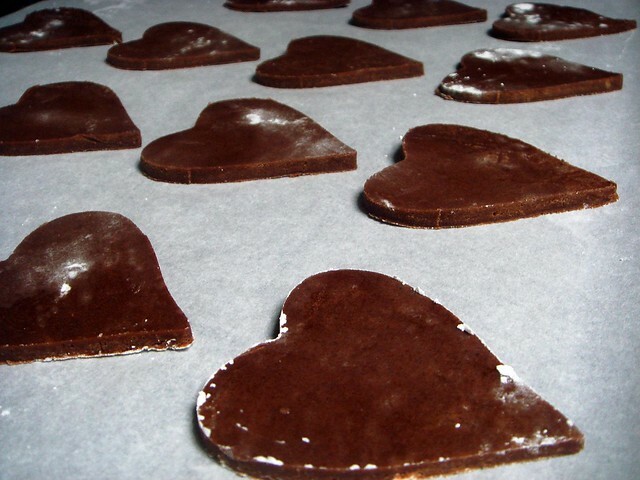 Bake until cookies show slight resistance to touch, 9 to 12 minutes, rotating baking sheet halfway through baking time; if cookies begin to darken on edges, they have overbaked. Cool for 5 minutes, then, using spatula, transfer cookies to wire rack; cool completely. Repeat steps 3 and 4 with remaining dough disks and scraps, rerolling scraps. Decorate as desired. Makes about 4 dozen 2 1/2-inch cookies. Looking for a simple treat with minimal preparation? 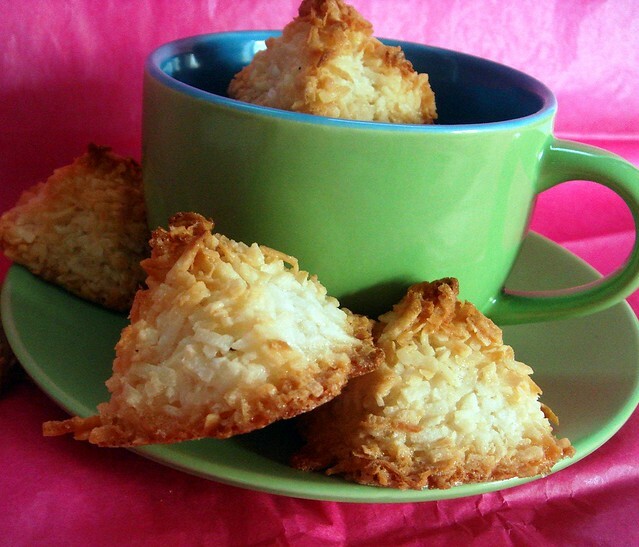 Look no further than the classic coconut macaroon. 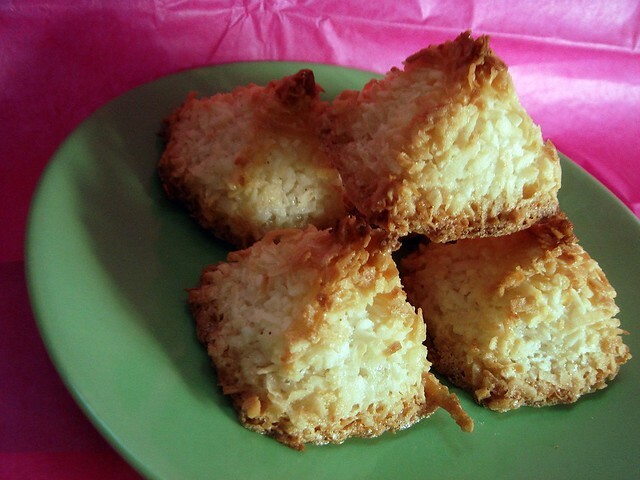 A macaroon is just that, a cookie/confection hybrid made up of sugar, egg whites, and coconut as the main ingredients. They're like a Mounds bar, but have the potential to be so much more depending on what you put into it. Obviously, you can also dip them in chocolate. I chose to be simple this time and just add half lemon extract and half vanilla extract. The recipe I used called for chopped dried cranberries, though I opted to not use them. Unsweetened coconut really is the way to go for these things to minimize the sweetness, though if you reduce the sugar they'll probably work (though possibly ooze a bit while baking). If strands of coconut bother you, simply pulse briefly in a food processor to break the shreds up. 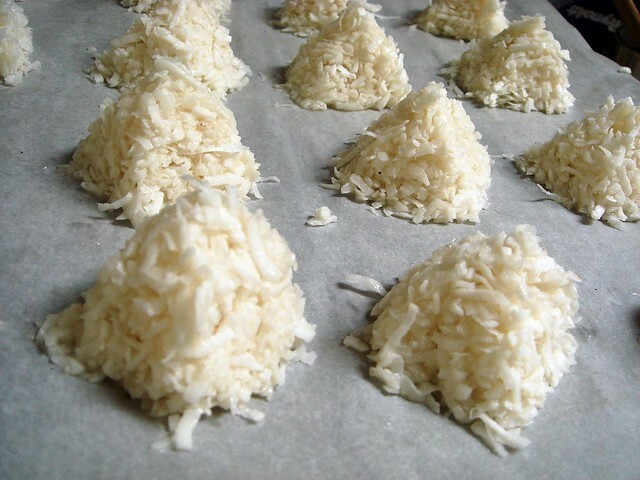 The fun part of making macaroons is forming them into mini pyramids. Dipping your fingers in water keeps the mixture from sticking and makes forming the mounds easy. They look small when you form the mounts, though they puff up nicely once baked so don't be alarmed by the miniature size. Bake until the edges are golden and the outsides are dry. The insides should still be chewy, which is the draw of the macaroon. 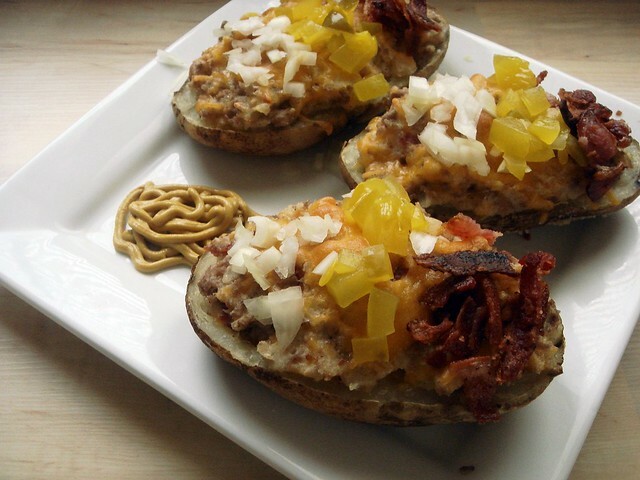 I want to make these again soon! Kroger's here in town started carrying unsweetened coconut for the same price as the regular kind, so I can see this becoming my new go to treat. I want to try some different flavors out! Preheat oven to 350°. 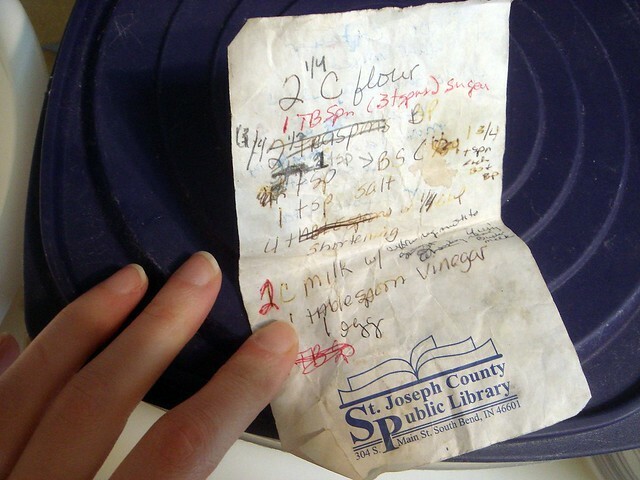 Line a baking sheet with parchment. Whisk the sugar, egg whites, vanilla and lemon extract, and salt in a large bowl. Toss the coconut with the egg mixture until completely coated. Moisten your finger tips with water. Form about 1 heaping tablespoon of the batter into pointed mounds or pyramids on the prepared pans, spacing them about 1-inch apart. 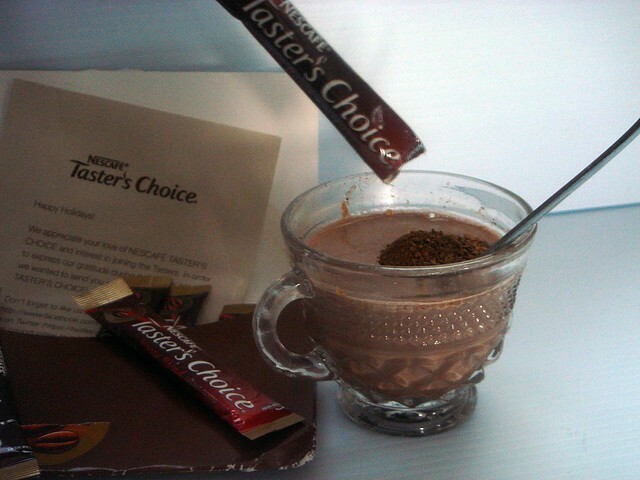 Taster's Choice sent a holiday gift pack of a selection of instant coffee single serve packets. It was a late gift as I got it earlier this month, but nice nonetheless! 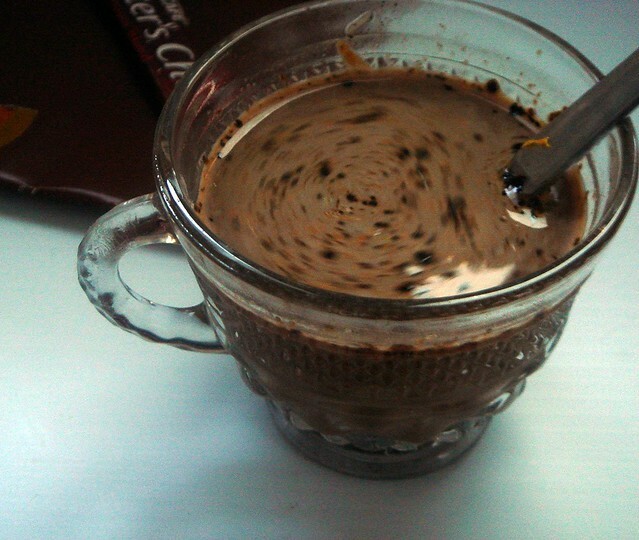 What I like about instant coffee is that I can mix some in to drinks, like hot chocolate or smoothies, without diluting it. Now, I know I could cold brew coffee and freeze ice cubes, but for a hot beverage that wouldn't work. 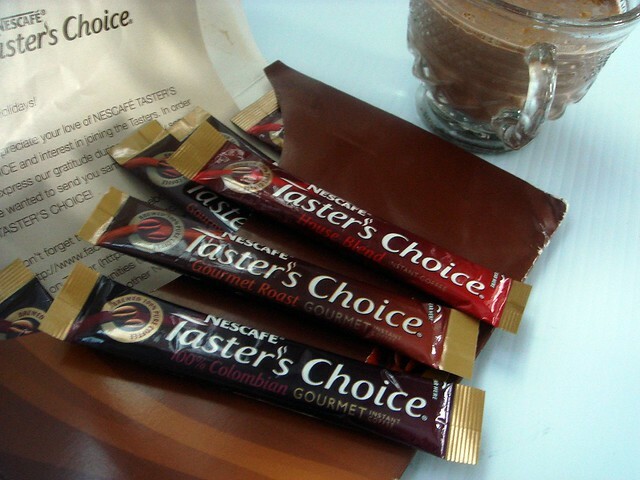 The individual packets make it simple bring a taste of coffee with you on the go. My favorite flavor of theirs is the French vanilla. I'm not going to suggest that this replaces the taste of aroma of traditionally brewed coffee, but as far as instant coffee goes the taste is alright. Not overly bitter but with a decent strength and a nice range of roasts and flavors. The price is pretty decent (not sure exactly what it is, but compared to other brands it's on the low side) and you can find coupons on the Taster's Choice website. What's your favorite way to use instant coffee, if you drink it? 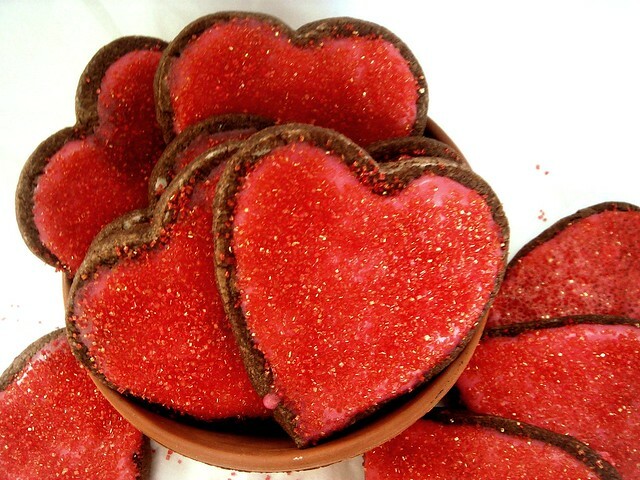 What better way to say I love you than with a treat that won't send your lover into a diabetic shock? Hey, I had to temper the mushiness. I'm sorry. Since my stock of Stevia In The Raw hadn't been used up, I decided this was the perfect time to try their recipe for red velvet cupcakes. Therefore, it reasons that using a sugar substitute will produce a sub-par result. 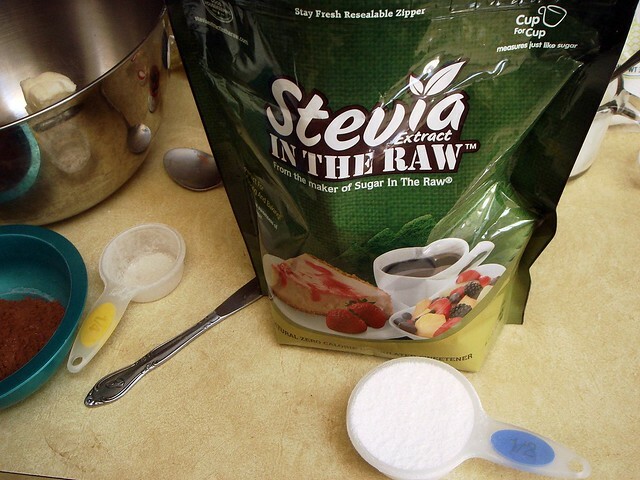 Knowing this, Stevia In The Raw recipes replaces just half the regular sugar with stevia, allowing the sugar to do its thing but at the same time reducing the calories. Will you still notice a difference? Yes. I'll explain later on. While this recipe was straightforward, I didn't feel like whipping egg whites. Following the technique of Dorie Greenspan's Perfect Party Cake, I added the egg whites to the buttermilk and gave the batter a 2 minute whip after the baking soda and vinegar were added. The batter was voluminous and tasty. Now, most brands of stevia have a rather unpleasant licorice aftertaste. This brand is better than many because the aftertaste isn't very pronounced. I started tasting it after a while, especially in the cream cheese frosting, but this was most likely to tasting the batter... Multiple times. Like licking the beaters and finished off the bowl. The family tested some and didn't really notice it, so that's another plus for this brand. 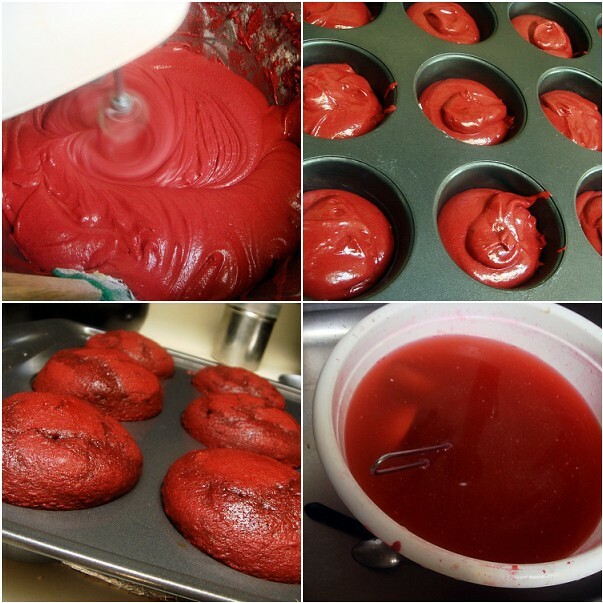 The recipe calls for 3 tablespoons red food coloring. I used an entire 1 ounce bottle of Wilton's coloring paste, which says "concentrated" on the label. I may or may not have tasted it in the batter. This isn't the no flavor version, I don't think. I didn't taste it after the cupcakes had baked up, luckily. However, I'm not sure if I used too much of this type of food coloring. Look at the bowl filled with water! My changes to the frosting was using just 4 tablespoons butter (for a very lazy reason -- I didn't want to get more out) and adding 1 1/2 cups confectioners' sugar. I realized I didn't want a straight up cream cheese frosting, and since I turned half the batter into a 6-inch layer cake I would need more for frosting it. 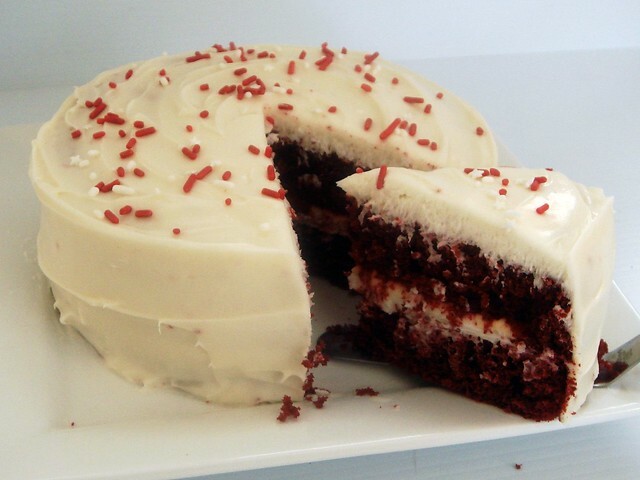 I'm not going to type those instructions out since other recipes can be found, like the one I linked to below (for my favorite red velvet cake). I can't complain about this recipe. It produced such wonderfully domed cupcakes. The height was so stunning that I paused before covering them up with the frosting. The memory will live on in pictures. The texture was a little rubbery and a bit on the dry side but not bad at all. 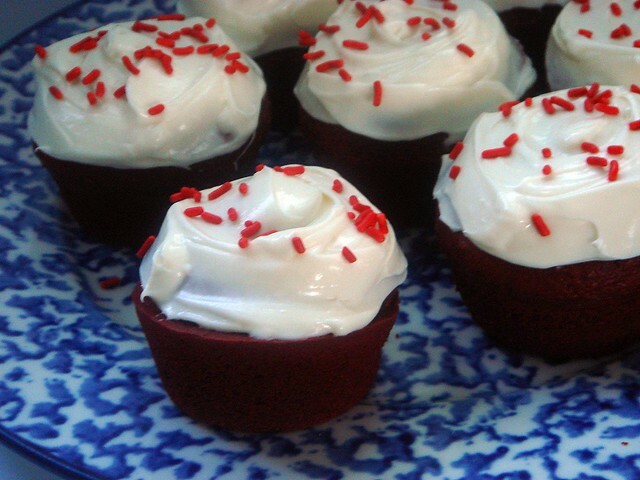 I definitely would make these for friends and family concerned with sugar intake, though it's not going to replace my favorite red velvet cake recipe. That recipe doesn't use any baking powder and I wonder if that's why this recipe was on the rubbery-bouncy side. 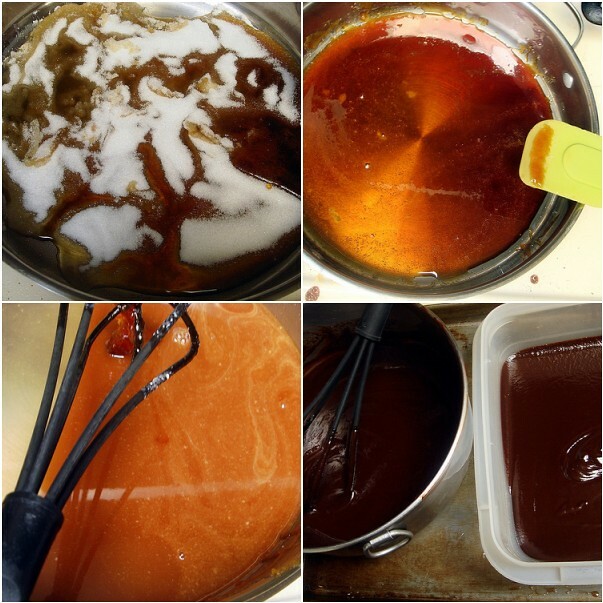 The recipes are almost similar otherwise, though this one called for 3 tablespoons dye. I prefer my modification of 1 tablespoon dye and teaspoons of raspberry jello powder I talked about in that post. 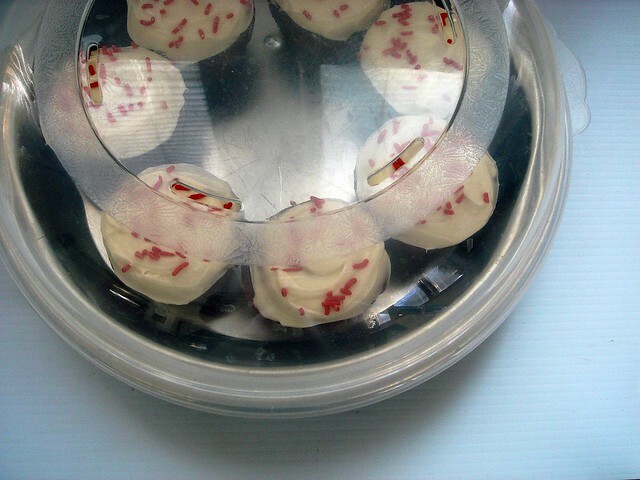 I found another use for the Nordic Ware covered pie pan I reviewed, though it can only fit 8 cupcakes. Tiny cakes are adorable. 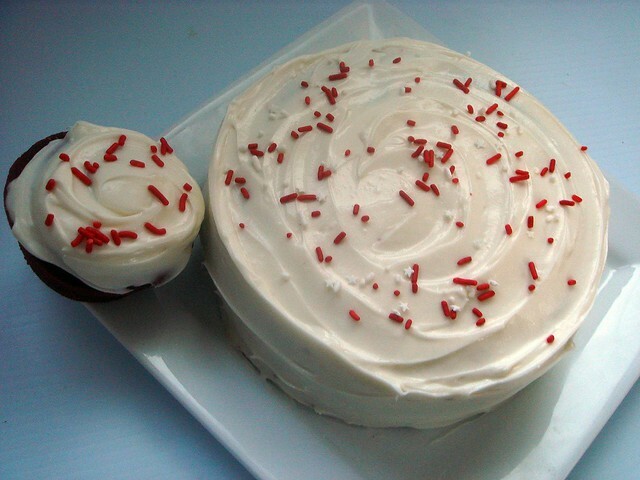 This little 6-inch double layer red velvet beauty was made with the remaining batter after making 12 cupcakes. It took about half an hour to bake, so next time I will use both of the cake pans I prepared. If you only have two people in your household, you can make half the recipe. If you make the full recipe and give away or freeze the extras. I'll leave you with a question: If muffin tins don't have to be greased and floured (assuming you aren't using liners), why do cake pans? I've never had much trouble getting cupcakes out of the tins, and I only grease the bottoms (my Wilton pan is nonstick). However, I would never ever not grease and flour cake pans. In fact, I almost always line them (I didn't this time and it released perfectly). Maybe it's because the cake pans I use have ridges on the bottom and that's why cakes stick if I don't use parchment. Preheat oven to 350°F. 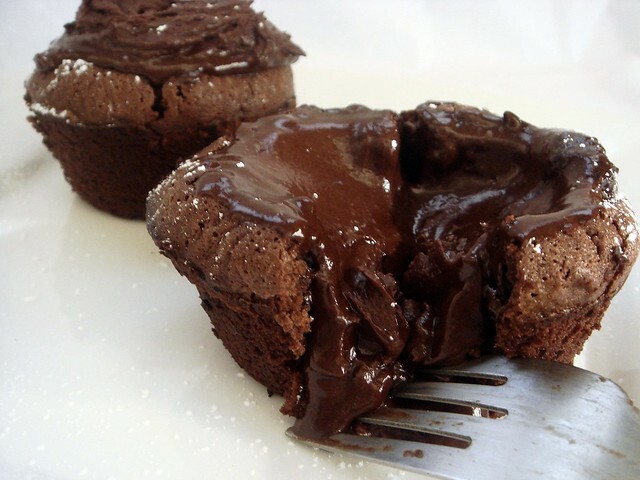 Grease two 12 cup muffin tins or use liners. 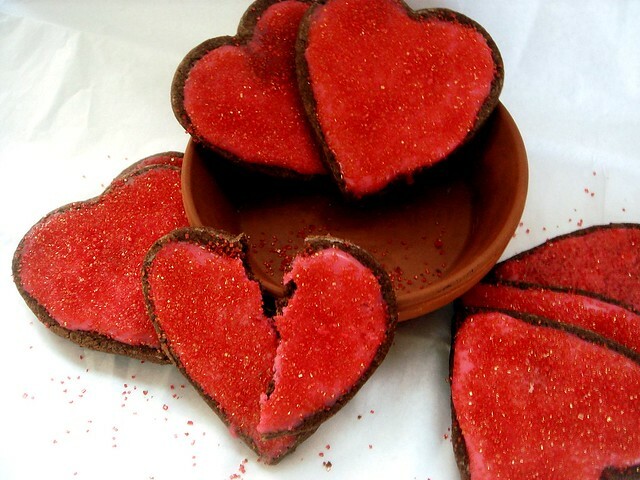 In small bowl combine cocoa, red food color and vanilla, set aside. In large bowl beat together butter and granulated sugar for 3 minutes. Add yolks one at a time and beat well after each addition. Add cocoa mixture and blend well. In another bowl, whisk egg whites with buttermilk. 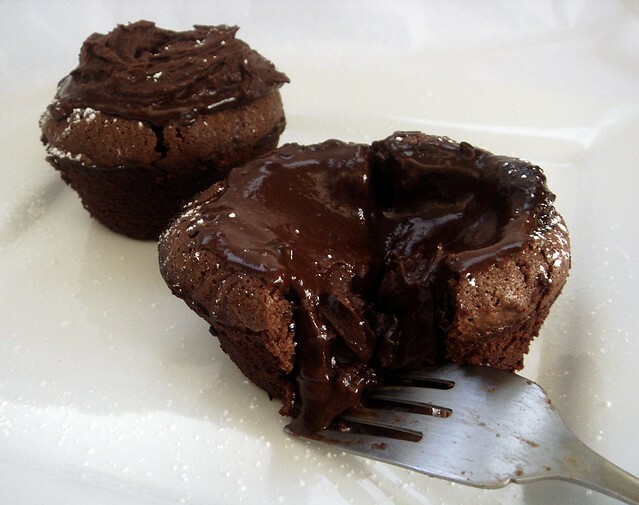 Combine Stevia Extract In The Raw, cayenne pepper, baking powder, and salt with cake flour. Add buttermilk mixture and flour mixture to cocoa mixture, alternating a third at a time beating after each addition. Combine baking soda and vinegar then add to batter and blend well. Beat for an additional 2 minutes. 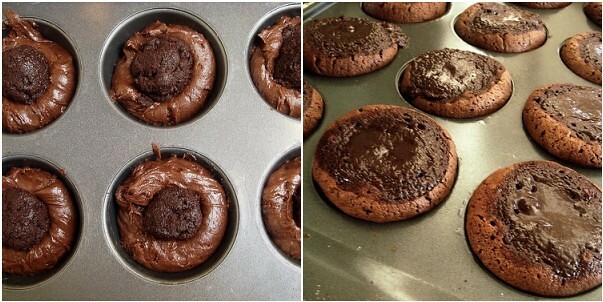 Fill each muffin tin 2/3 full with batter. Bake 13-15 minutes or until a toothpick comes out clean. 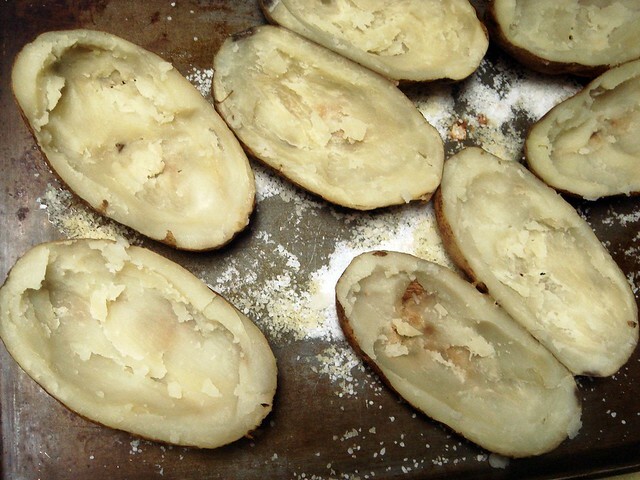 Remove from oven and let cool 5-10 minutes before removing from tins. Cool cupcakes on rack before frosting. In a medium bowl combine all ingredients and blend well. Makes enough frosting for 36 cupcakes. 120 calories, 45 calories from fat, 5g fat, 3g saturated fat, 0g trans fat, 2g protein, 16g carbohydrate,1g dietary fiber, 170mg sodium, 45mg cholesterol. 64 calories, 44 calories from fat, 6g fat, 3.6g saturated fat, 0g trans fat, 2g protein, 1g carbohydrate, 0g dietary fiber, 48mg sodium, 16mg cholesterol. Today was warmer than it has been for at least 2 weeks (30 degrees with minimal wind), so I took advantage of it and got my run in, just in time to watch guys compete with feats of athleticism while the rest of us glutton out. The snow was falling and there was accumulation, though fortunately the snow remained compact enough to run without losing traction. I sort of feel good for having done it. At the same time, I feel like I wouldn't really care if I hadn't (bad sign alert). Next week I plan to keep my weekly mileage at 20 and increase my long run the following week, aiming for 24-25 miles total. I'm doing alright so far but I'm struggling with motivation. Most of it has to do with this crappy weather. Did you know that last year in February, when the Colts were at the Super Bowl, that there was no fresh snowfall? Yeah, I remember, because I've decided that if I never see snow to this extent again I'll be okay with that. Pretty much I'm just coasting along hoping it'll feel better eventually. I also wish my new running shoes would just hurry up and arrive. My current pair, New Balance 100s, which are trail racing flats, just aren't cutting it in this snow. I need something sturdier in the slush. Also why this is officially the worst winter ever, I slipped and fell for the first time ever when I ran last Friday. I wasn't even running when it happened. I had slowed to a walk to turn around when I lost traction on the ice and slipped on the side of my hip. There's no bruise and it mildly hurts when pressure is applied. Winter, 1. Christina, 0. 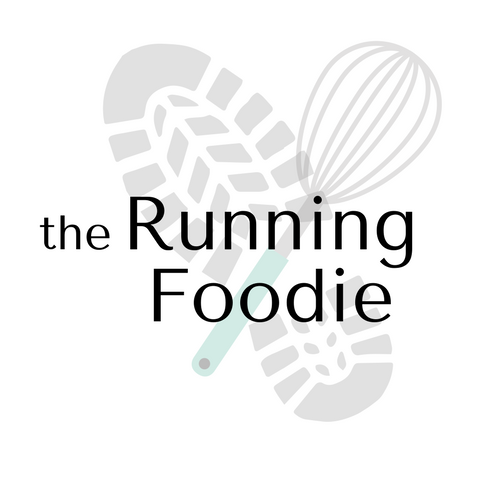 I've decided that I'd like to be maintaining a base of 25 miles per week by the end of April, making sure to vary the mileage of my runs so I'm not going on too many longer runs for my total mileage. When the weather improves and the road remains visible longer than a day, the plan is to incorporate speed work. What's been the worst part of winter for you? You may have heard of the ridiculous snowstorm that's been going across the Midwest the past few days. It's definitely put a stop to running since I don't have access to a treadmill, so I got some running in on Monday and Tuesday. Not really much, but my plan is to go back out tomorrow and Saturday or Sunday, finishing the week with 20 miles. When it comes to training for races I've always kept a loose schedule. In my mind. This kind of helps the bit of me that's type-A keep from becoming overwhelmed with sticking to a schedule even if it's not working, though lately its been more of an excuse to slack off. I don't get to the track much and somehow that translates to not running many tempo runs, either, two things I need to change. Perhaps over the next week I'll figure out a plan for a half marathon that will help me focus better on training. Concerning the half, I am contemplating running the Holy Half at Notre Dame. I had a great time last year as the weather was wonderful (for April) and the course relatively flat. My time was better than I expected so it left a good impression. Seeing people run in costumes was pretty funny, too, especially when Scooby Doo and someone else sprinted at the beginning and ended up fading into the back of the pack. The Waldo group did well, though! If not here, there's a May half I am considering, but it depends on what the weather decides for April. I've also decided to run the half at Sunburst this year. I've wanted to for a long time but was never in a position to do it, thanks to poor training preparation and also because I never made up my mind soon enough. I have until the end of March to register with early sign up! My main issue last year was that I started off the year running strong, but didn't reign myself in. I'm not entirely sure what all happened, but over-training was most likely the biggest factor. I will make sure to keep that from happening this year. How's running going for you guys? Are you dealing with the snow, or are weather conditions good? Any special races coming up? 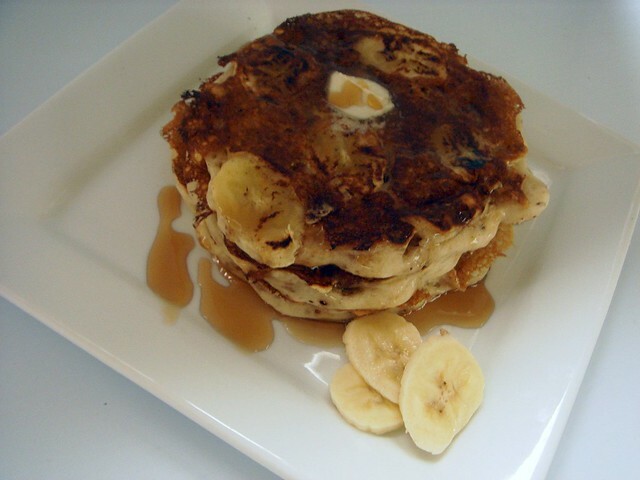 I posted about banana pancakes a long time ago but didn't include the recipe. Thanks to a recent reader request I'm finally blogging about the them again, this time with the recipe. 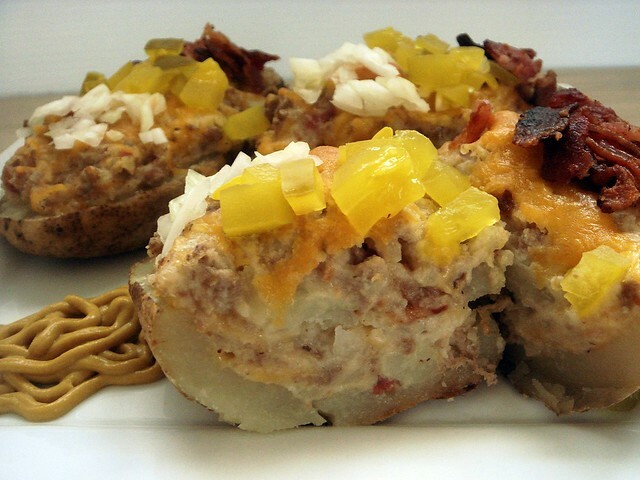 My mom created this recipe ages ago when she decided she didn't like traditional recipes. What makes these unique to your standard buttermilk pancake is that the fat isn't melted and mixed in with the wet ingredients, it's cut into the dry ingredients like you would for biscuits. This isn't to make flaky pancakes since the fat to four ratio isn't high enough, and because there's a higher liquid ratio, it's to create a fluffy and high rising pancake. We kept making alterations to the master recipe until we got it how we wanted. With a bit of sugar, a combination of baking powder and baking soda, shortening, buttermilk and an egg, you'll have everything on hand to whip these up for breakfast, lunch, or dinner. 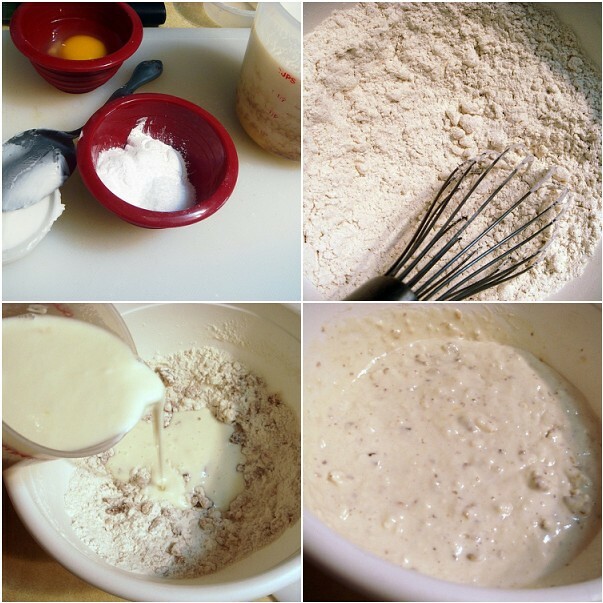 The rules for pancakes are the same for any other quick bread in that you don't want to over mix the batter after you've added the liquids to the dry. The batter should be mostly mixed with possibly a few streaks of flour, but lumps will always remain. Don't worry about it. If you mix to the point of a completely smooth consistency you'll over work the dough, over develop the gluten, and the texture will be wrong. After mixing the batter up, let it rest for 10-15 minutes. 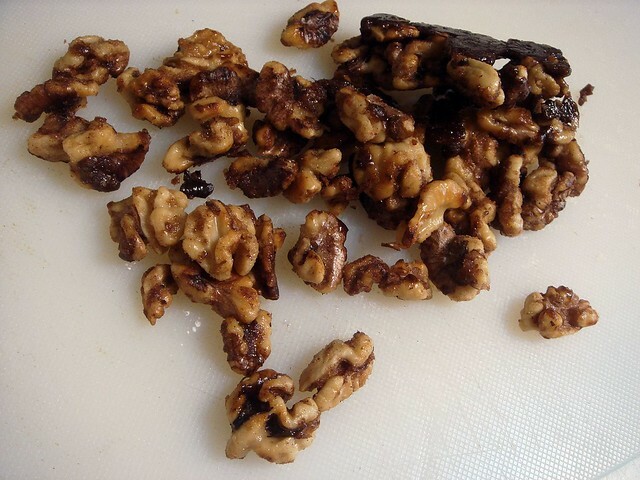 I enhanced the recipe a little by adding caramelized cinnamon walnuts. It doesn't take very long to make and adds a great taste and crunch to the pancakes. Toast walnuts for 5-7 minutes in a skillet then add butter. When it's melted, sprinkle cinnamon sugar on top and cook for another minute. Turn out onto a sheet of wax paper to cool and harden before coarsely chopping and adding to the flour mixture. 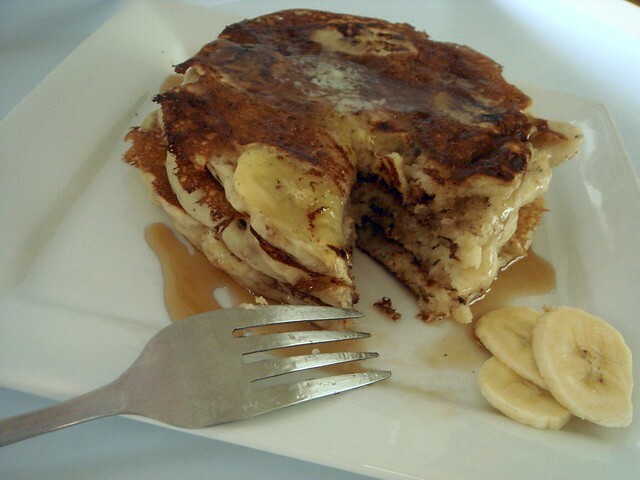 Each pancake is topped with five thinly sliced banana slices. 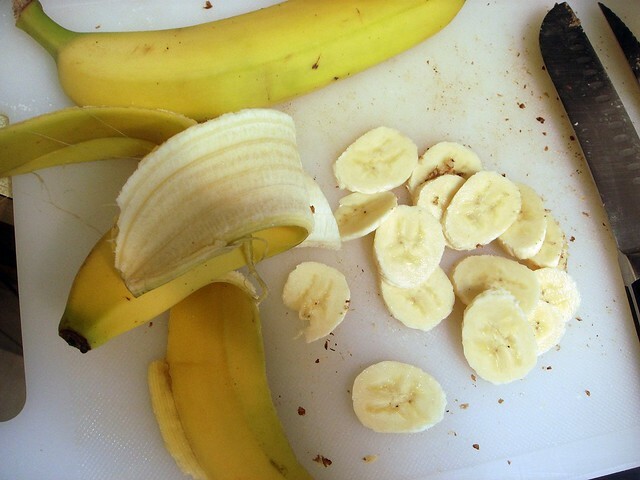 alternatively, you can slice two bananas into small chunks and stir into the batter. 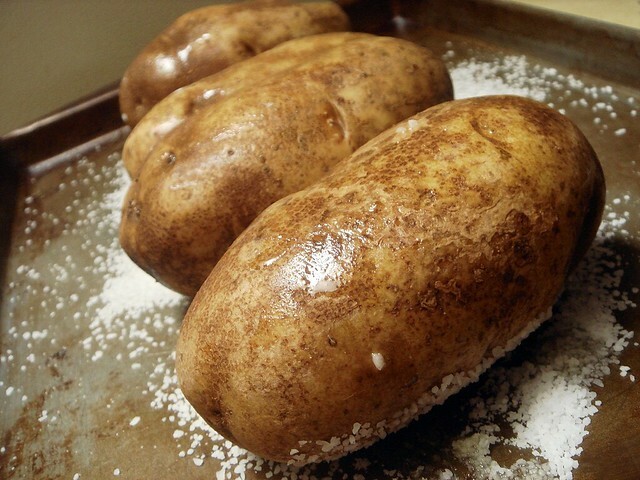 They might turn brown, so add a teaspoon of lemon juice to the liquids if you do this. The saying goes that the first pancake is always trashed. Well, it's a lie. If you properly heat the skillet up and spray with a light mist of cooking spray, you won't find yourself tossing the pancake out. I don't often pay attention to cooking time with pancakes because they kind of show you when they're ready to flip. As you can see in the top right picture, the surface is beginning to erupt with bubbles and the edges are still raw. This is when you want to flip it. 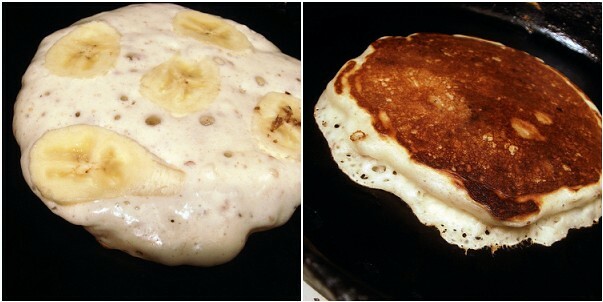 If the surface of the pancake looks dry, it won't rise as high after the flip. Whatever you do, DO. NOT. PRESS. THE. PANCAKE. DOWN. WITH. A. SPATULA. That's all there is to make delicious pancakes with a special twist to surprise your family this weekend. In a skillet over medium heat, toast walnuts until beginning to turn golden brown, about 5-7 minutes, stirring occasionally. Add butter to skillet and toss with walnuts until melted. Sprinkle with sugar and cinnamon; continue to stir with a spatula, coating walnuts, for 1 minute. Remove onto a sheet of wax paper. 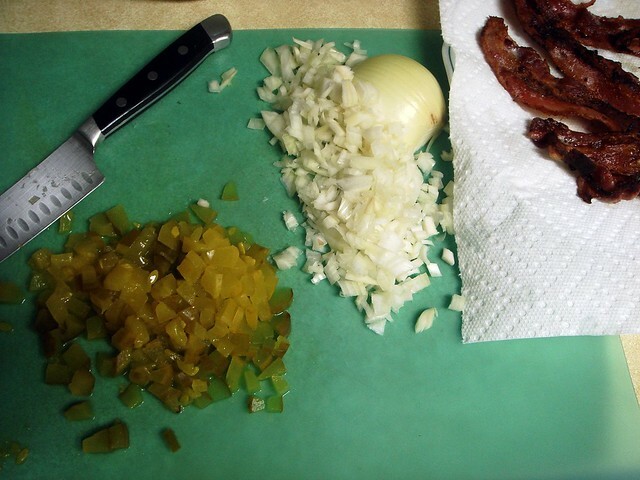 When cool, coarsely chop. Whisk together flour, sugar, baking powder, baking soda, and salt in a large bowl. Cut in shortening until flour resembles wet sand. Stir in chopped walnuts. In a small bowl, combine buttermilk, milk, and egg. Pour into bowl with flour and stir just until combined. Let rest for 10-15 minutes. Heat 2 skillets on medium. Spray surface lightly with cooking spray. Using a ladle, scoop no more than 1/2 cup batter per pancake onto center of skillet, spreading a little to create an even pancake. Top with 5 slices of banana. Cook for 1-2 minutes or until bubbles appear on surface (some will burst). Using a thin spatula, carefully flip pancakes and continue cooking for another minute. Place on plate, banana side up. Continue cooking pancakes in this manner. Serve with butter and syrup. Batter can be refrigerated for up to 4 days in a covered container.